Since the initial NBA BloodMove Case Study of 2013, the BloodMove Program has been acknowledged nationally and locally with award recognition and conference presentations. 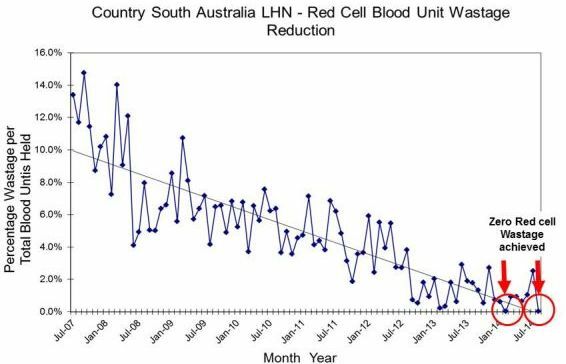 The greatest reward for the BloodMove Team was, however, achieving zero per cent (0%) red cell wastage in regional SA in February and August 2014 (see Graph). This is a significant achievement considering regional SA represents a health network consisting of 65 hospitals and health services which may perform transfusions. Forty five of these have a blood refrigerator, 35 of which routinely hold blood and 11 have on-site transfusion service laboratories. Importantly, BloodMove has developed and implemented a common Blood and Blood Products Inventory Manual for the regional SA health network and an accompanying set of forms, BloodSafe registers, audit tools, templates and ‘how to guides’. These documents have enabled all sites in regional SA to manage blood using a standard set of procedures including all processes and steps in the receipt, storage and return of blood and blood products. Every regional and remote hospital in SA that has a blood refrigerator has been formally ‘partnered’ with one transfusion service laboratory which oversees that blood refrigerator on a weekly and monthly basis (see National Blood Symposium 2015 Blood Fridge poster). These arrangements were previously limited to only sites holding emergency stock. In October 2014, this partnering arrangement was extended to all sites. Paper-based blood fridge quality monitoring documentation will be transferred to the recently available BloodNet Blood Fridges Module. BloodMove has now been implemented throughout all metropolitan Adelaide private hospitals. Each private hospital with a blood refrigerator is partnered with one private pathology transfusion service laboratory. Every transfusion service laboratory in SA now knows that every blood refrigerator in SA is managed under a partnering arrangement with one other NATA accredited transfusion service laboratory. BloodMove practices combined with regional SA and metropolitan Adelaide across public and private sectors has contributed to South Australia consistently achieving the lowest red cell wastage rate in Australia of 1.5 - 2% for the 2014/15 financial year to date (July 2014 to February 2015).